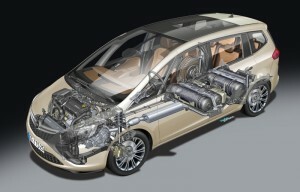 Fuel is most commonly stored on board vehicles in high pressure cylinders as compressed natural gas (CNG). As the name suggests, compressed natural gas is compressed into a high-pressure cylinder, usually to around 250 bar (or lower in some areas). Emerging methods of storage include Liquefied Natural Gas (LNG), which is already in commercial operation and Adsorbed Natural Gas (ANG), which is still in the developmental stage. Compressed natural gas (CNG) cylinders are available in a number of different types, weights and sizes to suit different applications. As a general rule, as cylinder weight decreases, cylinder costs increase. In some cases, cylinders are available for lease from vehicle converters or gas suppliers. Details of cylinder suppliers can be found in our Business Directory (see left). Additional information can also be found in our Guidelines for the Handling of CNG Cylinders document. Type 1: This is an all metal cylinder made of steel. There is no covering other than paint on the outside of the cylinder. This is the most common type of cylinder. Type 2: This is a metal cylinder (steel or aluminum) with a partial wrapping that goes around the cylinder. The wrapping is usually made of glass, aramid or carbon, contained in an epoxy or polyester resin. Type 3: This type of cylinder is fully wrapped with the same kind of material used for the partial wrapping of a Type 2 cylinder. This type of cylinder has a metal liner, usually aluminum. Type 4: This type of cylinder is fully wrapped with the same kind of material used for the partial wrapping of a Type 2 cylinder. This type of cylinder has a plastic liner. The importance of the weight of on-board CNG cylinders can vary widely, from critical to minimal relevance. Ultimately, the duty cycle of the vehicle will determine the most appropriate choice of cylinders. A perception that often arises is that not enough CNG can be carried because the cylinders weigh too much or take up too much space. However, if lightweight cylinders are used and the actual fuel needs of the vehicle are taken into account, the issue of weight can be significantly diminished (vehicles often carry more fuel than is actually required). As a rule though, you will generally need to fill up a CNG cylinder more frequently than a gasoline or diesel tank. With the advent of CNG home refuelling, this inconvenience will become minor for most private motorists. Driving into your garage and connecting your car to your home refueller means no more unnecessary trips to the gas station! In other cases, the cost savings on CNG versus gasoline or diesel make the inconvenience seem minor. For heavier vehicles, innovative solutions for cylinder locations include placement beneath the bunk in a sleeper cabin or on the roof (see image). 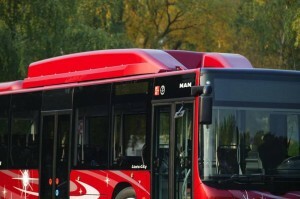 In some cases, especially buses, carrying the cylinders on the roof actually helps to distribute weight over axles more evenly. 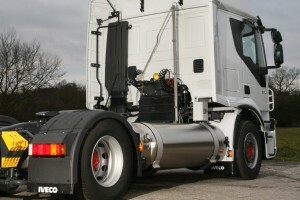 In situations where weight is an issue, cylinders may also be carried on a trailer (assuming the engine is on a Prime Mover), thus distributing the load over more axles. As always, such fit-outs should only be done by qualified and certified professionals. CNG cylinders have to be strong structurally in order to contain the high pressure gas. Prior to gaining standards and regulatory approval, the cylinders are subjected to a large range of tests specified by the relevant standard, which may include bullet impact tests and a bonfire test. In spite of these standards, care of cylinders must still be taken, particularly with the fibreglass wrapped and composite cylinders. They must not be subjected to rubbing or chaffing thus, once installed, appropriate measures to ensure adequate protection of NGV cylinder must always be undertaken. CNG cylinders are required to be inspected on a regular basis. The procedures required to ensure that CNG cylinders are safe vary, depending on the type of cylinder and the standard to which the cylinders are made. All installed cylinders must be stamped, showing the date of the last inspection and when the next inspection is due. The differences between compressed natural gas (CNG) and liquefied natural gas (LNG) are the methods of production and storage. Both fuels are primarily methane (CH4). LNG is natural gas ‘frozen’ to less than -162o Celcius (-212o Fahrenheit) to liquefy it. The advantage of liquefaction over compression is that the fuel is at a higher density, meaning more energy is contained in the same space – LNG is roughly 600 times the density of natural gas at standard pressure. In general, LNG is more commonly used for heavier vehicles whereas CNG is used for lighter vehicles. This is not a hard and fast rule though and both fuels may be used in either class of vehicle. Once the gas is liquefied, it must be kept cold or it will revert to its gaseous state, thus LNG cylinders are designed in a similar fashion to a thermos flask, (i.e. with substantial insulation). This design allows for the fuel to be kept cold for two weeks or more. ANG involves the storage of natural gas in a nanoporous material (usually carbon derived) at lower pressure than compressed natural gas, usually around 35 bar. The advantage of ANG is, like LNG, that the fuel is stored at a higher density. At this stage ANG is not commercially available or viable but a number of institutions are working on this issue.